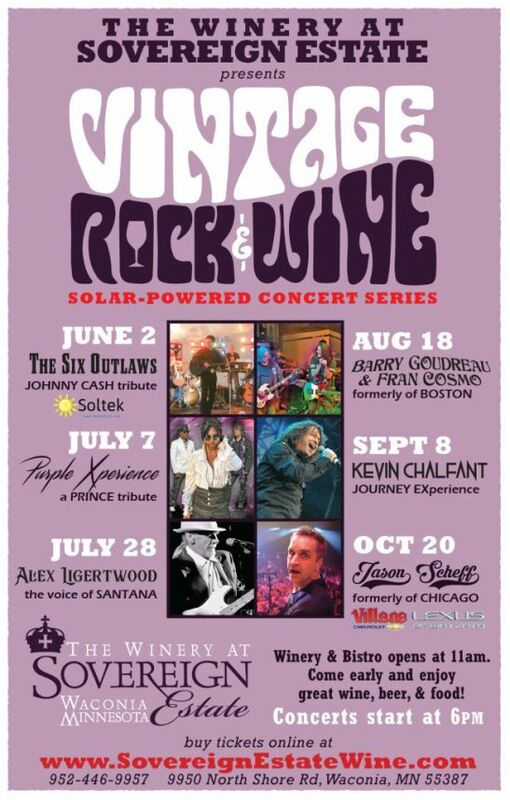 The Winery at Sovereign Estate in Waconia, Minnesota will feature six concerts for the 2nd annual Solar-Powered Vintage Rock n Wine Music Concert Series. Friday June 2, 2018. 6 Outlaws-Tribute to Johnny Cash. The Six Outlaws are the dream of Mitchell Hall of New Germany, MN. His deep baritone and austere style will have you conviced you are back in the 1950's listening to a young Johnny Cash. The members of the band all play in the authentic style - real instruments and amplifiers without digital processing - for an authentic sound. Band members include Jake Colson on guitar, Braedy Roepke on drums, Ben Banks (who happens to be Sovereign Estate's winemaker) on bass, Armando Corona and Jeff Schultz on trumpets, and Alyson Feltmann on vocals. Saturday July 7, 2018. Purple Xperience featuring Marshall Charloff. The Purple Xperience is a five-piece group hailing from Prince's birthplace, Minneapolis, MN. They have been touring around the country since it's inception in 2011 by Dr. Fink and front-man Marshall Charloff – bringing the greatest and most authentic production of Prince and The Revolution in the world to audiences of all generations. Since 2011 Purple Xperience has entertained well over 300 thousand fans and has shared the bill with The Time, Cameo, Fetty Wap, Gin Blossoms, Atlanta Rhythm section, and Cheap Trick. Lead singer, Marshall Charloff, not only styles the magic of Prince's talent in an uncannily unmatched fashion with his appearance, vocal imitation, and multi-instrumental capacity on guitar and piano, but Marshall performs nationwide fronting world-class symphonies in most major cities in the US and Canada. Recently, Marshall Charloff teamed up with the famous jazzman Marcus Anderson (New Power Generation, 3rd Eye Girl sax player) in Raleigh, NC to perform with the North Carolina Symphony Orchestra. Marshall recorded with Prince on the album 94 East, (where Marshall plays both, keyboards and bass guitar and Prince is on lead vocals). Saturday August 18, 2018. Formerly of Boston Barry Goudreau and Fran Cosmo. Barry Goudreau played guitar and backing vocals on Boston's hit debut album which sold 20 million albums and the the follow up smash "Don't Look Back". Goudreau also had a hit single "Dreams" from his solo album that he recorded with Brad Delp and Sib Hashian who were also formerly of Boston. Fran Cosmo exploded onto the Rock scene when he took over for Brad Delp as the lead singer for the Legendary group BOSTON in 1992. Fran was featured as the lead vocalist on the "Walk On" Album which sold over a million copies worldwide. Certified Platinum in America and certified Platinum in Canada. Fran's Lead vocals was also featured on four of the songs off the "Corporate America" Album and both of BOSTON'S Greatest Hits.The song "Livin For You" in which Fran also sang lead on was the only LIVE BOSTON song ever released on the Greatest Hits Albums. Saturday Sept 8, 2018 Kevin Chalfant's Journey Experience. Kevin Chalfant's Journey Experience features all of the lights, sounds and Journey-esque atmosphere you'd expect from a show called the Journey Experience! This is not a cover band but a very talented singer who served as the initial stand-in lead singer for Steve Perry with Journey LIVE! He performs all the hits that made Journey famous, one fabulous hit after another! After fronting Billboard charting sensation 707 in the early 80s, Kevin moved on to lead the powerhouse group The Vu later in the decade. In the early 90s Kevin co-founded the first act ever signed to Interscope Records, supergroup The Storm also featuring members of Journey and Santana. Saturday October 20, Jason Scheff, Longtime Chicago Lead Vocalist. Jason Scheff joined the multi-platinum band Chicago in 1985 replacing Peter Cetera. Scheff's lead vocals debuted on the 1986 single "25 or 6 to 4", a remake of the band's 1970 hit song. Scheff followed up with "Will you Still Love Me" and has sung Chicago's live classic hits in 4 decades. 80s, 90's, 2000's, 2010's including "if you Leave Me Now" "You're The Inspiration" "I've Been Searchin So Long" "Hard for me to say I'm Sorry" "Happy Man" "Hard Habit to Break" and more. Scheff delivered a blistering performance of "25 or 6 to 4" at the 2016 Rock and Roll Hall of Fame ceremonies for Chicago's induction.